Makes my day! If you have a Wii Nintendo player you know exactly what I meant here. Wii is one of the latest toys released and manufactured by Nintendo Company. As I am alone at home when the husband goes to work for the whole day, I left at home by myself. Winter never helps this too as it gets everything worse. So I need something to keep myself active inspite of the gloomy day that passes by. I’m glad, the hubby has so many games where I can play with. Never get bored as I want to aim specific and much higher score in order to achieve some gold medal. I know this won’t pay me any dollars but it help to give me an active daily life and keep me warm due to the movements or exercise that I’m doing while playing with the Wii Games. 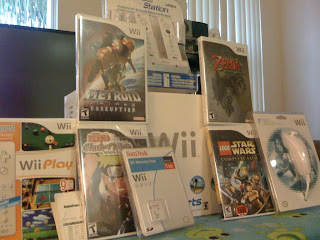 There are tons of Wii Games to buy and choose from. If you are the bored enough, I hope and anticipate that Wii Games or Wii Nintendo will help you work out with it.